has two main modules; the Calibration Management System (CMS) is used to manage your asset inventory and calibration laboratory’s operational processes. The Metrology Process Studio (MPS) is used to manage and execute your calibration tests, data collection and calculations. These applications integrate into the most advanced asset management and metrology software system available today. METBENCH is enhanced to help your organization meet quality management requirements including, ANSI ISO/IEC-17025:2005, ANSI/NCSL Z-540-1, ANSI Z540.3, 10 CFR 50 Appendix B, ISO-9001, 21 CFR Part 11, ISO-55000, and CFR 820 GMP’s. 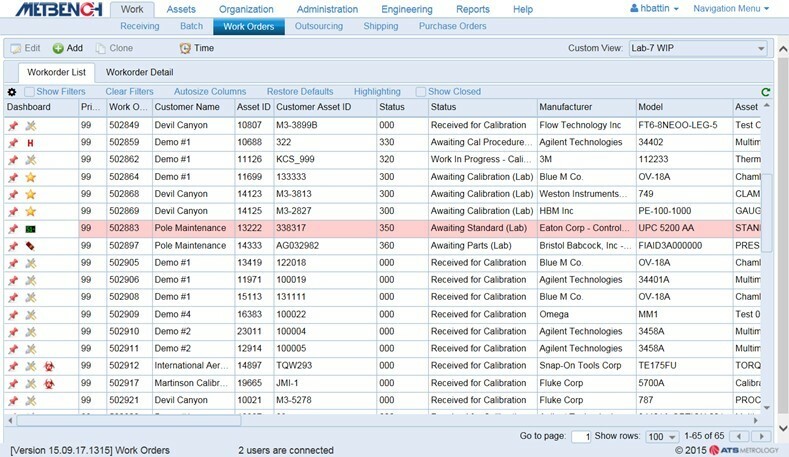 METBENCH can be fully integrated with your ERP system to optimize every step in your calibration/asset management program. is the asset management module of METBENCH which provides comprehensive workflow management for your calibration laboratory. CMS simplifies compliance with laboratory quality management systems, while providing comprehensive analytical and reporting tools. CMS is highly configurable and adaptable to manage any organization’s calibration management processes. CMS manages and tracks MTE assets throughout their life-cycle, while supporting the traceability and audit requirements of quality and accreditation standards. CMS designed with a consistent user interface where most forms look and operate in a similar fashion, making the program intuitive and easy to use. The CMS enterprise organization management function provides a graphical tree-view of your organization which can be configured to include all of the relevant entities within your organization, such as business units and calibration facilities. This function provides the ability to configure METBENCH to conform to your organizational structure, making it possible to grant or limit access and easily configure user permissions within the organization. Database Unique Identifiers throughout CMS make integration with your ERP systems straight forward. 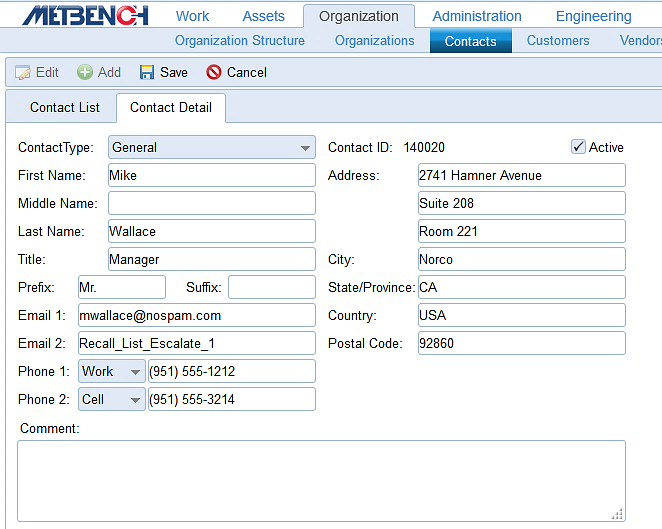 Contacts are managed from a global list, allowing contacts to be assigned to multiple customers, and/or facilities. Updated or re-assigned in a simple one-step process. You can easily sort and filter primary screen views (i.e. 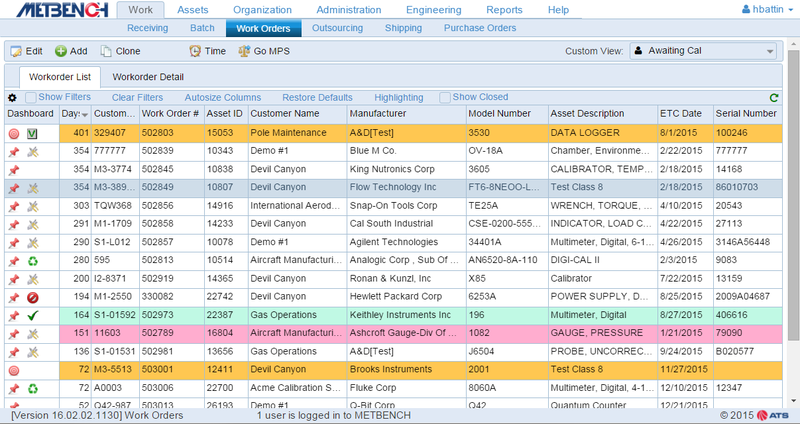 customers, work order, assets, etc.,), according to what information you would like displayed. User configurable row highlighting makes it easy to identify items of interest. 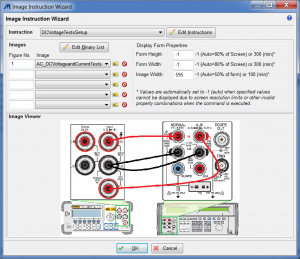 Multiple Individually configured views can be saved for easy access. For organizations that utilize outside vendors, CMS will easily categorize vendors by the type of services they are accredited to provide, and configure the system to restrict outsourcing of calibration work to qualified vendors, based on accreditation type. CMS Data structure enables users to modify data at multiple levels, ranging from changes at the system or equipment class levels, to granular changes at the asset or work order level. This enables users to easily manage data, by assigning it at the level with the greatest impact, while allowing the flexibility to make specific changes to one asset or one work order. The CMS work-flow management function starts with receiving an asset, through shipping the asset back to the customer. The receiving function is built for efficiency, and is barcode enabled, making the process simple and efficient. Multiple assets can be received into the system by simply scanning the barcode or entering the asset’s IDs, (or multiple other unique asset identifiers). CMS will segregate the assets by customer, and flag assets that fail validation, such as new assets or assets that already have an open work order. Items that fail validation can be managed and processed into the system directly from the receiving screen. The CMS work order manager provides users with a comprehensive set of tools that will elevate your laboratory operation to the next level of performance and efficiency. The functions available from the work order manager form are all permission based and operate as a visual indicator list with icons that are displayed when action is required or an item is on hold. Highlight indicators (that can be set to any color and font), allow users to easily identify overdue or priority items. Users have an instant window into their entire operation with tools that enable them to assign work, balance workload by technician or laboratory, update work order status, and communicate via email with customers and technicians. CMS custom views feature enable users to quickly filter information and identify items of interest. CMS is fully integrated with other METBENCH modules; from the CMS work order manager, users can navigate directly to an asset’s assigned MPS datasheet and run the procedure at the touch of a button. 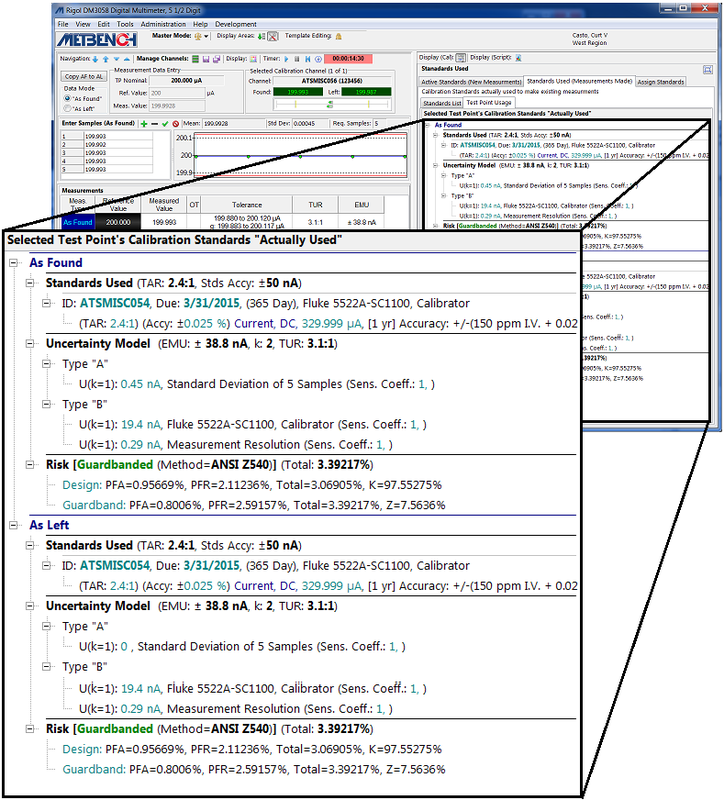 Historical calibration records are permanently linked within METBENCH in all three modules, so that the calibration is connected to the test point data and the standards used in a permanent, controlled record. Each record is protected with METBENCH security and robust audit trails that identify each time a calibration record is edited, along with the delta between the new and old versions of the records, with a username & date/time stamp. Tiered access permissions and security – Meets 21 CFR Part 11. Every aspect of METBENCH has been designed to help your organization comply with the requirements of an increasingly demanding quality environment. 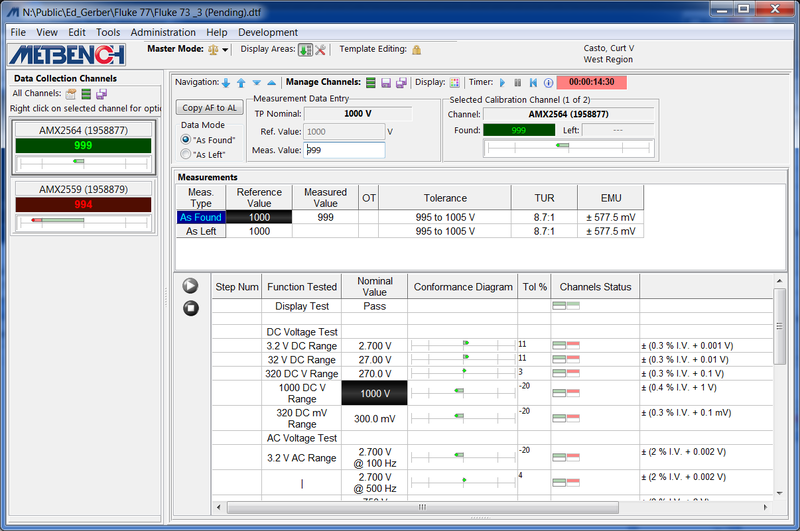 is the calibration module of METBENCH used to design, create, manage and automate data sheet templates for the calibration of measuring and test equipment. The system has multiple tools to facilitate the translation of equipment specifications into electronic data sheets. These electronic data sheets can then be used to collect and store calibration data for multiple instruments simultaneously. Automation scripting can be added to these data sheet templates to configure instruments, capture data, display instructions, perform mathematical operations, communicate with external software, and create instrument test points dynamically. The system provides a secure environment, with an audit trail to track changes to the system parameters as well as archiving of records. Each calibration test point inherits and stores globally unique identifiers of data sheet template test point, thus allowing the entire measurement history of individual test points to be accessed for statistical analysis. MPS features an “engineer in the box” system that automates many metrology engineering tasks. MPS automatically calculates uncertainty (EMU) and test ratios (TAR/TUR) using specifications and other parameters from a test instrument’s set point, the standards used, and measurement system configuration. The system supports multiple pre-assigned standards that the technician can choose from at the time of calibration. The actual uncertainty and test ratios reflect the technicians’ specific selections. 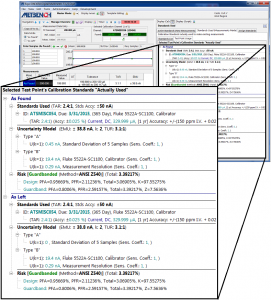 The MetBench MetSpec module is used to create and manage instrument specification files in a database format with accuracy specifications organized by function and range limits. MPS uses these instrument specifications for both calibration standards and to create data sheet test points. Using the MetSpec instrument specifications’ function and range limit data, MPS can automatically assign the most accurate qualifying instrument range for calibration standards to the data sheet test points or the person creating the data sheet template and choose a range manually. MPS features an “engineer in the box” system that automates many metrology engineering tasks. MPS automatically calculates uncertainty (EMU) and test ratios (TAR/TUR) using specifications and other parameters from a test instrument’s set point, the standards used, and measurement system configuration. The system supports multiple pre-assigned standards that the technician can choose from at the time of calibration. The actual uncertainty and test ratios reflect the technicians’ specific selections. 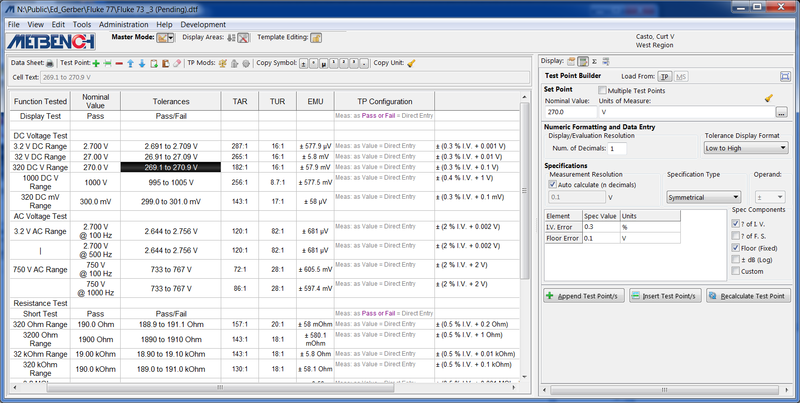 The Test Point Builder is a design tool used to rapidly create test points from instrument specifications. The Test Point Builder permanently embeds specification components into the test point, allowing users to load them back into the Test Point Builder, with a simple click, for corrections or modifications and updates to the test point. You can also assign a MetSpec instrument as the source of Test Instrument (TI) specifications. The Test Point Builder allows the user designing a data sheet to select an instrument range and then loads the specifications into the Test Point Builder. METBENCH MetSpec electronic Instrument specifications can be assigned as default/alternate calibration standards, and automatically integrated into the test point uncertainty models. 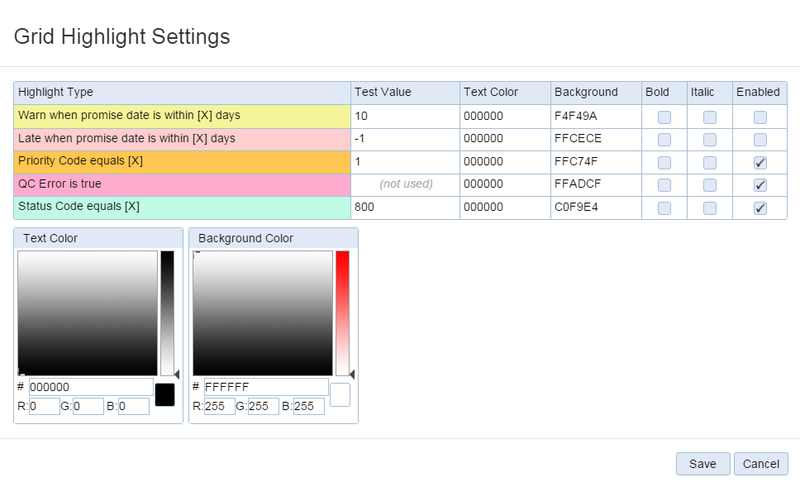 Of course, users can disable any of the automatic features and manually create/modify uncertainty elements. Additional elements can also be manually added to supplement those that are managed by the automatic features. MPS provides the option to automatically implement one of its supported guard banding methods (NCSLI RP-10, ANSI Z540.3, RSS), at the configured risk threshold. Test Ratios (TAR/TUR), Estimated Measurement Uncertainty (EMU), and Risk are all based on the actual standards used when performing the calibration. Guard banding decisions are made dynamically, based on the conditions present at time of the actual measurement. 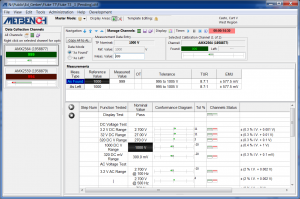 MPS allows concurrent calibration data collection for multiple test instruments. For example, you can calibrate an unlimited number of thermocouples at the same time by opening a coresponding number of channels in MPS. MPS automatically computes and graphically displays the relationship of the measured values to reference value, tolerance, and guard band indeterminate region, when applicable. MPS also indicated the percentage of the tolerance band consumed by the deviation between the measured and reference values. MetSpec is a library of instrument specifications, in electronic format, used by MPS to perform a number of unique functions, such as building calibration test points, and calculating measurement uncertainties of calibration standards. MetSpec is also used to create reference Units of Measure and their conversion equations to and from their base unit. The Units of Measure system is used to perform real time conversion of accuracy and parametric matching criteria values between data sheet test points and calibration standard instrument ranges. The system can be configured so that the standard deviation of the test point samples can be automatically included as a Type “A” uncertainty element. MPS measurements have a child relationship to test points, allowing each measurement to have independent references such as Reference (True) Value, tolerance, standards used, and uncertainty model. This also allows calibration standards selection options to be changed at any time during a calibration without effecting measurements already made. MPS integrates the National Instruments VISA system to communicate with instruments via multiple interface types such as GPIB, RS-232, USB, Ethernet, etc. 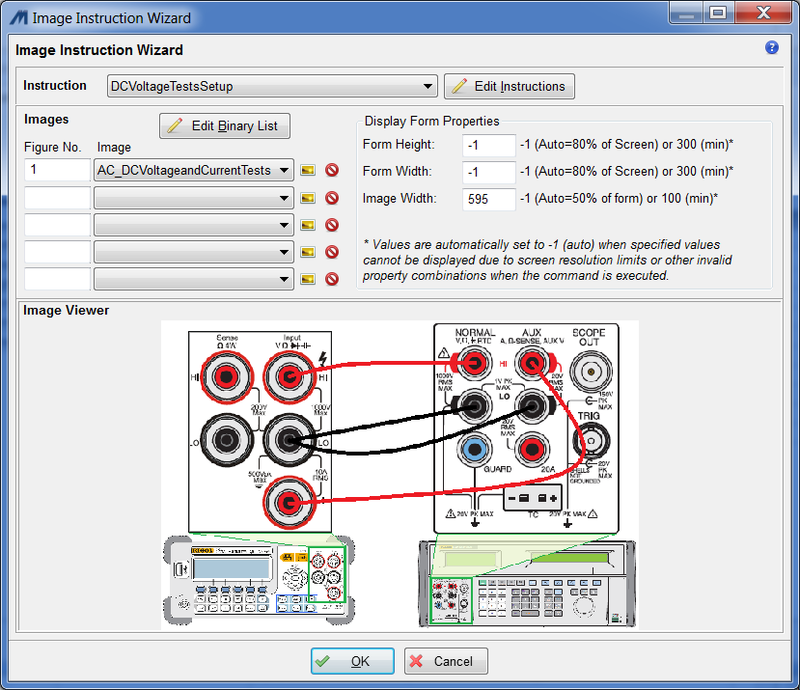 The scripting system provides multiple methods for displaying rich text formatted (RTF) instructions and graphical images. User query prompts can be used to have the user enter values or select from a predetermined list of options. Multiple values can be requested and may include instructions or an explanation of the values to be entered. The commands that apply measured values fully support sampling and automatically apply measured value formatting rules and determine if measurements are in or out of tolerance. The automation system automatically applies the samples/measured value to the currently active test point, calibration channel, and data mode (As Found/As Left). When multiple TIs are being calibrated together, there are commands to select the currently active channel, obtain information from one or more channels, and permanently store raw data in a channel. Datasets are a basic two dimensional spreadsheet that can be written to, read from, perform math operations on columns and rows, and can be independently saved to, or loaded from, an external file. The automation system allows you to create and configure as many dataset objects as you require. 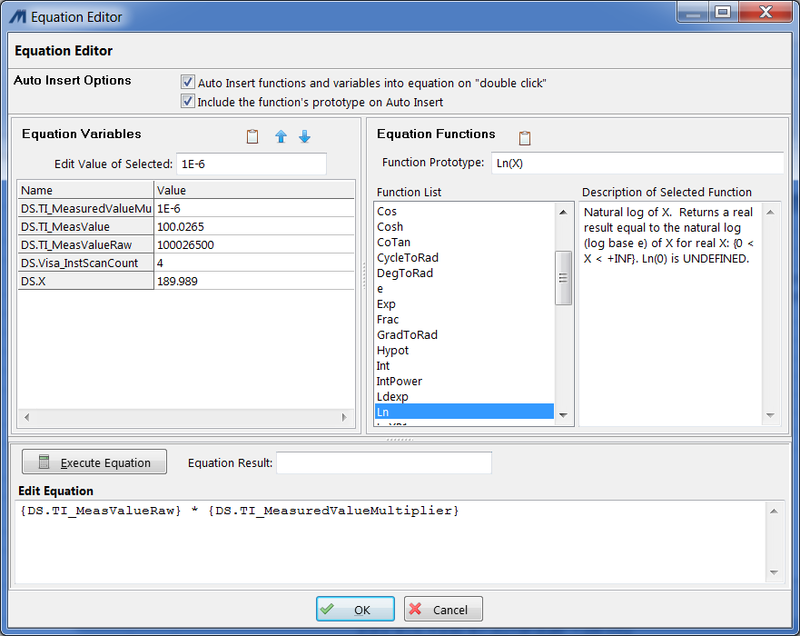 The wizards for the math and string builder (complex string equation) commands are equation editors. 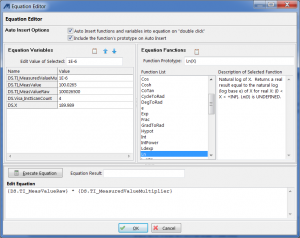 These equation systems include a large number of built-in functions and support the use of variables. MPS has several commands to dynamically modify data sheets to facilitate use of generic data sheet templates. For example, you can prompt the user for information, such as the specifications for a specific torque wrench. The values returned can then be used with a command to reconfigure all of the test points to the nominal values and tolerances of the specified instrument. The automation system supports the creation and use of sub procedures that can take arguments (values passed in and out), and have their own local variables. You can create an unlimited number of global variables and name them as you see fit. Many Commands have wizards to help you configure their parameters, and make it much easier to learn and configure the commands. MPS can be easily configured to assign users different permission levels to approve data sheet templates and instrument specifications; requiring e-signatures when appropriate. MPS has a comprehensive audit trail system. Transactions involving document approval, revision, inactivation, etc., generate an entry into the audit logging system. Log entries are also made for user login and failed login attempts. The application’s master configuration options allow users to modify system behavior, to meet your laboratory requirements and practices.